The City of Portland turned 163 years old this year. It is young compared to cities on the east coast and a mere babe compared to cities in other parts of the world. Even with its relative youthfulness, Portland is a city with history. You can see it in our public spaces such as our Olmstead-designed parks and our pioneer cemeteries, the parts of our street grid that is a remnant of the streetcar era and in our homes and offices. In fact, more than half of Portland’s buildings are older than 50 years old and there are over 20,000 buildings that were built before 1910. Whether or not we are consciously aware of it, these buildings connect our present with our past and provide context for our shared identity. As Portland continues to evolve and grow, we face the difficult task of trying to accommodate new people, new jobs, and new buildings, while preserving the older buildings that make our city a special place. How do we balance new development with historic preservation? How do we decide what we should fight to keep and what we can let go of? These are challenging questions and to answer them, we first must understand how Portland designates its historic resources and what tools are in place to preserve them. Historic Landmarks: These come in three forms. The first is a “local” landmark designated by the City of Portland. As of 2009, there were 127 local landmarks. Examples include Duniway Elementary School in Eastmoreland, Olympic Mills Commerce Center in the Central Eastside Industrial Area, and Portland Community Music Center in the Creston-Kenilworth neighborhood. The second is a “national register property” listed in the National Register of Historic Places. As of 2009, Portland had 546 properties on the national register. Examples include Laurelhurst Park, Mt. Tabor Park, and Sellwood Branch YMCA. The third type is a National Historic Landmark. Portland has two of these: Pioneer Square and the Skidmore/Old Town Historic District. In order to be on the national or local landmark lists, a property owner must go through an extensive process to demonstrate the resource’s historical, cultural, or architectural significance. The designations are largely treated the same by Portland’s zoning code, with one big difference. National landmarks must go through a Type IV land use review before they can be demolished. Local landmarks do not have to go through a land use review but they are subject to a 120-day delay before they can receive a demolition permit. In terms of preservation, the code makes it significantly more difficult to demolish national landmarks than it does local landmarks. Conservation Landmarks: These are individual resources designated by the City of Portland that may have a “lesser” level of significance than historic landmarks. As of 2009, Portland had 12 conservation landmarks. They are treated like local historic landmarks in the city code and are subject to the same 120 day demolition delay. Historic Resources Inventory (HRI): As part of the city’s Comprehensive Plan update in the early 1980s, there was a citywide inventory to determine properties with potential historical and/or architectural significance. As a result more than 5,100 properties are on the HRI. It is important to note that being on the HRI is not a true historic designation. These properties have the potential to receive historic designation if the process is initiated by the property owner. It is noteworthy that properties on the HRI are also subject to a 120-day demolition delay, but that property owners can avoid this delay by simply asking the city to remove the property from the list. It has been 30 years since the inventory effort was last made – Portland’s Historic Landmarks Commission and others think it is time for an update. Historic Districts: Just like individual properties, historic districts come in two flavors: local and national. In Portland’s case, all 15 of its historic districts have been designated as such both locally and in the National Register. These districts include Ladd’s Addition and East Portland, Grand Avenue. Just to add to the confusion, properties within a historic district can either be classified as “contributing” or “non-contributing” resources. Contributing resources are from the district’s historic period and are subject to much stricter land use rules if the property owner wants to make changes or to demolish the buildings. Non-contributing resources do not always have the same restrictions and do not have a demolition delay. 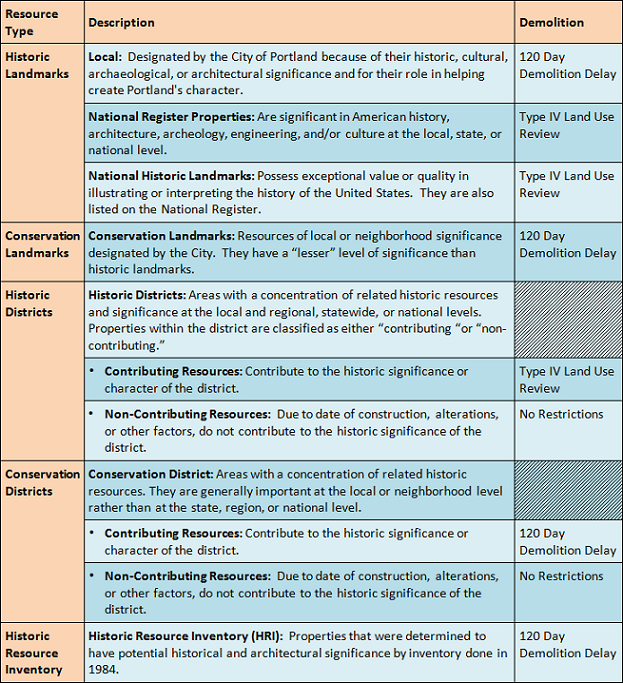 Conservation Districts: These districts are designated by the City of Portland, but have “lower” significance than historic districts. Portland has six conservation districts, all located in North and Northeast Portland. Properties within these districts can also be listed as contributing and non-contributing. Contributing properties have a 120-day demolition delay requirement and non-contributing properties do not. Properties and districts listed on the national or local historic designation lists are subject to the City of Portland’s historic resource review. This means most changes to the exterior of historic and conservation landmarks are reviewed to make sure they preserve a building’s historic characteristics, features, and materials. Additionally, construction of new buildings in historic districts undergoes a historic design review with the goal that new buildings support the district’s historic qualities. The city’s zoning code offers property owners a number of incentives to preserve historic properties. Depending on the property’s location and zoning, these might include the transfer of unused density from one site to another, additional residential density allowances on properties, less onerous and costly conditional use review processes, and greater allowances for non-residential uses. All of these incentives are designed to entice property owners to maintain a historic structure. What Does It All Mean in Terms of Preservation? Portland has a lot in place to try to preserve its historic landmarks and districts – not to mention the local, state, and federal grants and other financing tools that support preservation. However, designations, reviews, and incentives are imperfect tools. The designation process for an individual property is difficult and requires a motivated property owner to initiate it. Creating a recognized historic district requires a massive amount of work from neighborhood volunteers and agreement from over half of the district’s property owners. Historic resource reviews are discretionary in nature and don’t always get things “right”. Incentives only work if they are more enticing than the alternative of knocking something down and building something new. Finding a balance between property rights, preservation, and growth is a challenge, and that challenge is likely only going to increase as Portland continues to grow and as our buildings continue to age. It may be time to re-examine the tools that are in place to see what is working, what isn’t working, and what else could be added to the mix. As we continue our discussion about Portland’s Comprehensive Plan and what we want the city to look like 20 years from now, it may also be time to re-examine our relationship with historic and cultural sites. What are our values and how should they be reflected in the buildings and places in which we live?